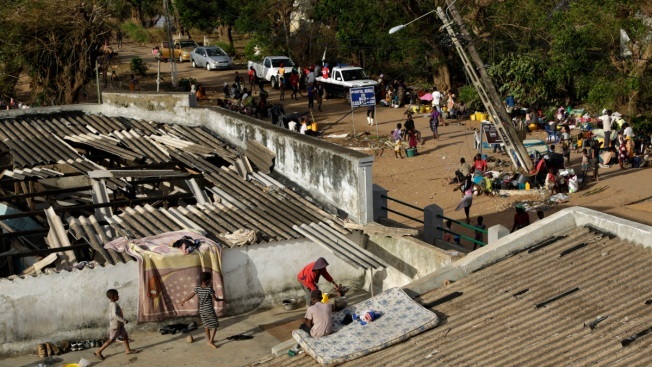 Displaced families set up their bedding on top of the roof in Buzi district, 200 kilometers (120 miles) outside Beira, Mozambique, on Saturday, March 23, 2019. A second week has begun with efforts to find and help some tens of thousands of people in devastated parts of southern Africa, with some hundreds dead and an unknown number of people still missing. Cyclone Idai's death toll has risen above 750 in the three southern African countries hit 10 days ago by the storm, as workers restore electricity, water and try to prevent outbreak of cholera, authorities said Sunday.